An international research team from UC San Francisco, Rush University Medical Center in Chicago, and Necker Hospital in Paris has devised a blood test to identify FSGS patients at risk of repeat kidney injury following transplantation. 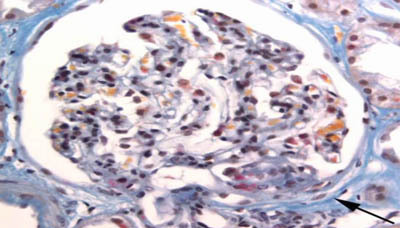 In developing the blood panel, nicknamed FAST (FSGS Antibody Screen For Transplant), they also uncovered a potential drug target for recurring FSGS. Studying blood samples from patients with and without FSGS, before and after transplant, they identified circulating antibodies linked to recurrence. Antibodies to a particular protein, CD40, were strongly predictive of post-transplant kidney injury. Minnie Sarwal, M.D., Ph.D., professor of transplant surgery at UCSF explained, “We found that during FSGS recurrence, the antibody binding to the CD40 protein in the podocytes of the kidney drives injury to the kidney’s filtering unit with leakage of protein and scar tissue, and blocking this CD40 antibody appears to reverse injury.” With more study, the scientists hope that this blood test and promising drug target will allow physicians to identify and treat high-risk patients before transplant.